A. Straighten crepe hair by loosening braid and wetting the hair. Stretch the unbraided strand completely straight (or to the desired waviness) and allow to dry. Hair can be force dried with a blow dryer or an iron set to "wool". B. Apply a thin coat of spirit gum to the chin area. Hair work should be started under the chin. Each thin layer of hair should be layered over the previous section of hair to cover desired area and build thickness. 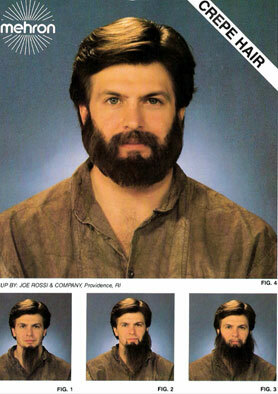 C. Build sides of a full beard toward sideburn area. D. Layer moustache from the edge of upper lip up to nose. E. Trim beard and moustache to desired length. For realism, the hair should be sparse and evenly applied. Hair can be "finger waved" and sprayed with hairspray. Hints: Work neatly and in thin layers with spirit gum. Gum dries quickly so work on small areas. It is helpful to powder scissors and your fingers as they become sticky with gum. Mix more than one color of hair into the beard.